I love the shot of George laughing. It shows their relationship is full of joy. Makes me smile and feel a little bit better about the world when I see that lovely shot of the two of them sharing a laugh. I agree! I saved that shot on one of my Pinterest boards for the same reason! Hi Nati, you are able to understand German. What a message. isn`t that great. Nobody needs to wear rags, although she/he is an activist. ZEITmagazin ONLINE of today. This is a very well-recommended maganzine – not a cheap tobloid. 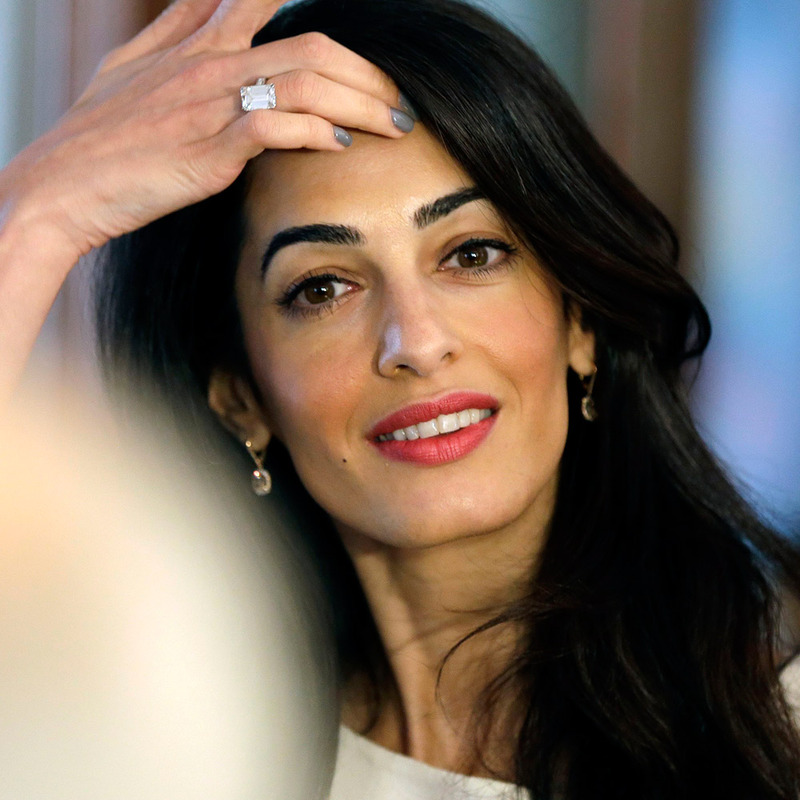 Amal Alamuddin, verheiratete Clooney, beweist nahezu jeden Tag, dass ein engagierter Mensch den Kampf für eine gerechtere Welt nicht zwingend im Büßerhemd oder in der Jutekutte bestreiten muss. Ihr reicht in aller Regel eine Edelrobe in der Signalfarbe rot. Die im Libanon geborene Juristin hat das Menschengeschlecht um eine neue Unterspezies erweitert – die Aktivistin als Stilikone. Amal war drei, als sie mit ihren Eltern Beirut verließ und nach London floh. Eine Fachöffentlichkeit lernte sie als Anwältin kennen, die unter anderem den WikiLeaks-Gründer Julian Assange vertrat. Zur Globalheldin des Boulevards wurde sie, als sie George Clooney in einen kuhäugigen Ehemann verwandelte, der davon schwärmt, wie toll es ist, mit einer Frau verheiratet zu sein, die klüger ist als man selbst. In diesen Tagen, da Europa darüber streitet, welchen Empfang es Flüchtlingen bereiten soll, kann uns Amal Clooney daran erinnern, welches Potenzial in ihnen steckt. thanks again and again for this wonderful and entertaining blog. I have another article for you about Amal in our German weekly paper “Die Zeit”. It says that she prooves that a dedicateded person doesn’t have to fight for a better world in a penitential robe or a jute frock. She seems to have augmented humankind with another Sub species: the activist as a style Icon. In these days, when Europe is arguing what kind of a welcome it wants to give to refugees, it is Amal (having to flee form Beirut to London during the Linanon war), who reminds us, how full of potential refugees may be. I don’t think she fits the archetype of the ‘refugee’. Her family were affluent enough to leave Lebanon and they did not apply for refugee status in the UK, they came on working visas. They left Lebanon in the same way many wealthy Russians are leaving Russia today. Amal is not an activist. She’s also not a style icon. Style is about so much more than the way someone looks and/or dresses. For me, she is a style icon since the beginning of this blog and currently for all the most fashion magazines. I agree with you, Morna, that Amal is not an activist, nor is she a style icon. A true style icon would be someone like Twiggy or Alexander McQueen – people who defined their generation and who weren’t defined *by* their generation. Amal doesn’t push fashion in any revolutionary way. She basically dresses like any other fashionable socialite/trophy wife. Yes, I agree with you Morna and Lady. Amal is not a style icon – and that’s why I generally like her style! It’s a wearable version of the catwalk, and largely uncontroversial. Perfect for someone like me. Although I have to say, wearing clothes that are super expensive and sent to you by the same cluster of designers is getting somewhat tedious. Also, Amal strikes me as being over dressed most of the time. Great article! I agree with you that Amal is not an activist. She has the potential to be so and I hope she takes that path. Nati, this is really frustrating. I understand you have to moderate comments but at least do it with some level of objectivity. Or, alternatively, don’t post eg. Hello Mag articles that will generate comments that go beyond how nice Amal looks. Morna, your comments are always quite negative. If you don’t like her, it would be simply better to ignore her. I agree that this blog is best when there is objectivity from the moderator. That is what’s expected from moderators. But then again, I don’t really mind Nati’s comments – she’s always really polite, even when disagreeing. But I do think that Nati, if you want this blog to be full of people who admire EVERYTHING about Amal, then you will lose half of our most interesting commentators. I for one will no longer read it – the conversation would be so dull. I do find Amal interesting and was drawn to her initially for her quirky style but that doesn’t mean I like everything about her or am happy to go along with every piece of adoring, sycophantic rubbish that gets written about her. @Anna – thank you 🙂 and I agree also that Nati, in general, handles all opinions with grace and good humour, and I really appreciate that and have said so on other threads. But the blog is about Amal news and style and not all her news and style is going to generate positive comments. That’s just the way it is for anyone in the public eye. This article is full of nonsense Amal has gone to school and worked in New York. It is not new to her. Neither of them is interested in politics .